Tyehimba Jess’s latest book of poetry, Olio (Wave Books, 2016), was a finalist for The 2016 National Book Critics Circle Award and received the 2017 Pulitzer Prize for Poetry. 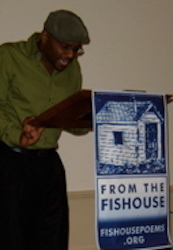 His first book, leadbelly (Verse Press, now Wave Books, 2005), is a winner of the 2004 National Poetry Series. He won the 2001 Gwendolyn Brooks Open Mic Poetry Award, an Illinois Arts Council Artist Fellowship in Poetry for 2000 2001, and the 2001 Chicago Sun-Times Poetry Award. He was on the 2000 and 2001 Chicago Green Mill Slam teams, received a 2005 Literature Fellowship from the National Endowment for the Arts, and was a 2004-05 Winter Writing Fellow at the Provincetown Fine Arts Work Center. A proud Cave Canem alumnus, he is a member of the creative writing faculty at the University of Illinois at Urbana-Champaign. Jess’s fiction and poetry have appeared in Soulfires: Young Black Men on Love and Violence (Penguin Books, 1996), Slam: The Competitive Art of Performance Poetry (Manic D Press, 2000), Bum Rush the Page: A Def Poetry Jam (Three Rivers Press, 2001),Beyond The Frontier: African American Poetry for the Twenty-First Century (Black Classic Press, 2002), Role Call: A Generational Anthology of Social and Political Black Literature and Art (Third World Press, 2002), and Dark Matter 2: Reading the Bones (Aspect Press, 2004). His first non-fiction book, African American Pride: Celebrating our Achievements, Contributions, and Legacy (Citadel Press, 2003), was published in December 2003.